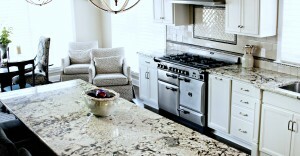 Fact: In the US, stone has become the countertop of choice over man-made surfaces in all new and remodel construction. Most of the stone used in kitchens is billions (with a ‘b’) years old. Humanoids have used stone in the procurement and preparation of food for at least 2.5 million years. By the way, archeologists use the somewhat oxy-moronic term, “Lithic Technology” to describe this. 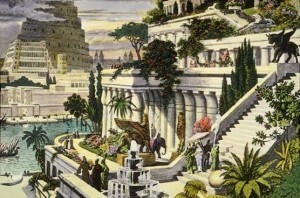 All but one of the Seven Wonders of the Ancient World were made of stone. Can you name the exception? 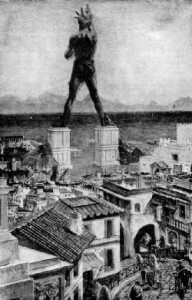 …The fifty foot tall Colossus of Rhodes was said to be made of mostly iron, bronze and brass. So, for centuries (both BC and AD) we have been using stone for its functionality, artistic aspect, and permanence. The Industrial Revolution changed the way stone was quarried, transported, and processed (cut). The gang saw was invented in Vermont in the 1880’s. While it took nearly a week, this machine could cut multiple slabs (sheets) out of a single block of stone at one time. In fact, all of the major advancements in recent “lithic technology” are a result of improvements in logistics (moving the stone) and cutting equipment. OK, so here’s where it gets ironic. Stone has been around for billions of years, man has used stone for millions of years, but it wasn’t until the late 1990’s that everything changed. Prior to that, almost all stonework was for commercial/monument purposes. In other words, unless you were building a shrine, it was just too expensive for everyday applications. It was then, that cutting tools began to use diamond-wire saw blades. The machines that utilized this technology quickly became commonplace at (and near) the quarries in almost 50 different countries around the world. This allowed for the quadrupling of efficiency in extracting, slabbing, and transporting stones. The days it took to slab a ten ton stone, now took just hours. Large format CNC cutting beds (like we use at StoneKitchens) took the guess work out of forming and finishing and have reduced the risk of mistakes and rework. Over time, the kitchen has become the focal point for home gatherings. Just look at the size and location of the kitchen in a century-old home and it quickly becomes apparent… things have changed. We entertain in our kitchens now, and while your kitchen may not be the Hanging Gardens of Babylon, it is certainly worthy of our stone work. Let us help you. StoneKitchens: Fewer Seams. Better Fit.